Prick the cleaned potatoes 6 times in different places with a fork. Place in the microwave and cook on high heat for around 25 minutes, or until just tender when pierced with a knife, checking and turning every 5 minutes. When cooked remove and set aside to cool. Heat a non-stick frying pan over medium heat. Add the bacon and cook, stirring regularly for 5 minutes or until just coloured. Remove from heat and place bacon into a mixing bowl. Using clean kitchen scissors “snip” slices of the spring onion and add to the bacon with the corn. Preheat oven to 200 degrees C Fan Forces and line a large baking tray with baking paper. Carefully cut the cooled potatoes into quarters and scoop out some of the potato inside being careful not to go too close to the skin (leave about ½ cm). Add the potato insides to the mixing bowl with the bacon, corn & onion. Add ½ of the grated cheese along with the sour cream and ketchup and season well with S&P. Mix well. Place the skins skin side down on the baking tray. Use a pastry brush to dip into the olive oil and “paint” each skin with some olive oil. Bake skins in the oven for about 5 minutes or until just golden. Remove from the oven and carefully spoon some of the filling mixture into each skin. Use your hands to carefully press it down and form it into a pile. Sprinkle with some of remaining cheese and return to the oven for another 5 minutes or until cheese is melted and bubbling. Set aside to cool for 5 minutes before serving with sour cream and tomato ketchup. 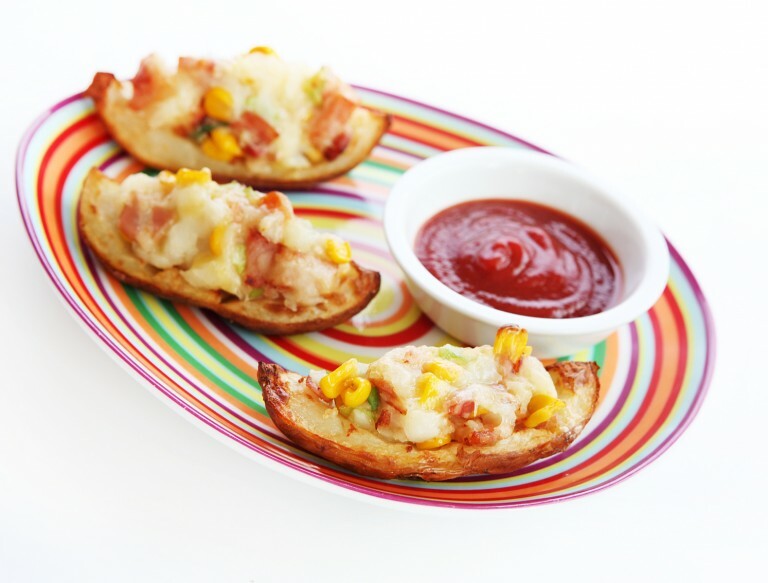 Tip: This is a fantastic recipe for kids to create, with a little adult support, and enjoy!